Located in Dublin is one of the city’s most historic attractions known as the Kilmainham Gaol. It is currently considered one of the largest unoccupied gaols in Europe. Many Irish revolutionaries of the 1916 Easter Rising were imprisoned and executed here when it was used as a working prison. Although currently, its a visitors museum where people can learn about its remarkable history and tour its facilities much of which haven’t been changed since its opening. 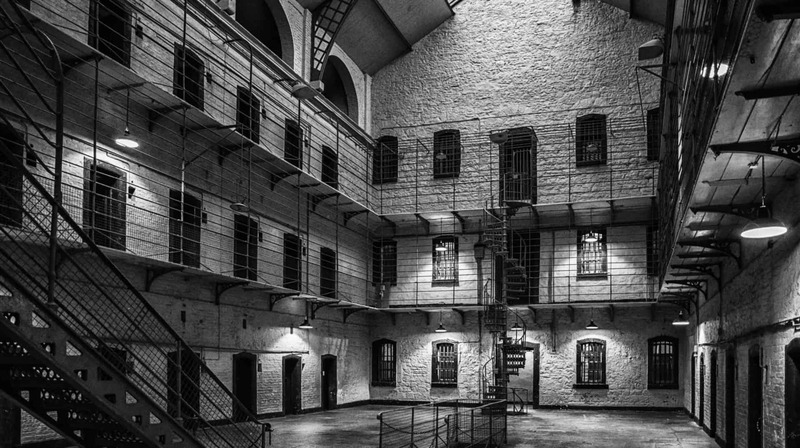 If you’re looking for things to do in Dublin, Kilmainham Gaol offers a fascinating part of Irish history to uncover. Take a guided tour of Kilmainham Goal to experience what life was like for prisoners, how they lived and hear all the incredible stories. The Gaol was first founded in 1796 known as Dublin’s ‘New Gaol’. It was used as a working prison until 1924. Not only is Kilmainham Gaol recognised as the largest preserved Victorian jail in Europe, but it has been historically notable in Ireland’s fight for independence from Britain. Within Kilmainham Gaol there was no segregation of prisoners; whether you were a man, woman or child. Up to five people were placed into a cell together. The facilities weren’t the best with each cell having a single candle for light and heat. Prisoners of Kilmainham Gaol spent most of their time in the dark and cold as each candle would only last for around 2 weeks. The jail cells were roughly 28 square metres in an area, so you can imagine just how cramped it would get. Even children were placed in the gaol for petty theft. One of the youngest prisoners recorded was a seven-year-old child. The treatment of men and women was also notably different in Kilmainham Gaol. During an inspection in 1809, it was discovered that male prisoners were given iron bedsteads whereas women “lay of straws on the flags in the cells and common hall”. There was no sign of change for the women prisoners as time went on. Although a women’s section was introduced in the West Wing it was always overwhelming overcrowded. There was an attempt to help with the overcrowding in 1840. 30 new female cells were created. Unfortunately, these improvements happened a short time before the famine hit Ireland that saw Kilmainham Goal increase highly in prisoners. Many people committed crimes during the Famine knowing they would be guaranteed a basic diet in the gaol. Kilmainham Gaol became so overcrowded that people had to sleep in the corridors. The goal was used as a prison during the War of Independence in Ireland and saw people like Robert Emmet, Charles Stuart Parnell and most of the leaders of the Easter Rising imprisoned here. It saw fourteen leaders of the Easter Rising be executed in the Stonebreaker yard at the Gaol. Including one of the most influential leaders James Connolly, who was the last to be executed. 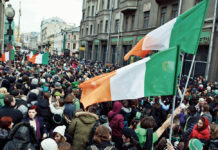 The rising and the death of Irish revolutionaries marked a huge turning point in Irish history. These horrific executions changed public opinion in Ireland, leading to the Irish War of Independence and the creation of the Irish Free State in 1921. The Gaol officially decommissioned as a working prison in 1924. Kilmainham Gaol remained empty and neglected until the 1960s. The Gaol represented as a place of awful suffering and oppression and during this period no one was interested in preserving it as a monument. However, in the 1920s the Irish Prison Board consider reopening it as a prison again but plans fell through and were abandoned. There was also a possibility of demolition Kilmainham Gaol altogether but the cost stopped this idea going forward. In the 1930s a Republic interest was developing around the Gaol and a proposal was put forward by the National Graves Association to keep the site as a memorial and a museum to 1916 Easter Rising. The proposal was received by the Commissioners of Public Work, costing the project at £600. Negotiations began with the Department of Education hoping that they could bring artefacts related to the Easter Rising housed in National Museum to the new museum that was being created at the Gaol. The Department of Education rejected this idea as they saw the gaol as unsuitable for its purpose. However, they did suggest that the paintings of nationalist leader could be installed in the prison cells. The proposal was put on hold for the remaining duration of World War II. Once the war was over, an architectural survey was commissioned to evaluate Kilmainham Gaol. Although this revealed that the prison was in complete ruin. The Commissioners of Public Work did suggest that the prison and all cell blocks deemed as national importance should be preserved. Anything that was considered of little importance was proposed to be demolished. However, their proposal was never acted upon. Again in 1953, the original proposal to turn Kilmainham Gaol into a museum and memorial was considered by the Department of Taoiseach. It was part of a scheme to help create employment. But still no progress was made and the prison was left to continue to worsen. In the 1950s’ a grassroots movement saw the push for the Kilmainham Gaol restoration, and so it began. When the ideas of demolishing the gaol where spreading, the Kilmainham Restoration Society was created in 1958. It was created by a young engineer, Lorcan Leanard from the north side of Dublin. He was joined by a number of like-minded nationalists and they agreed that they wouldn’t discuss any of the events associated with the Civil War in relation to the restoration project. They produced a narrative of a unified national struggle in hopes this would get the restoration the go ahead. A plan was then created that would see the prison be fully restored and used as a museum using free labour and donated items. The popularity of the project began growing, this saw the Irish Congress of Trade Unions accepting of the society’s proposal. The Building Trade Council also gave their support to the project. During this time the Irish Government was under extreme pressure from the National Graves Association in preserving the gaol. So when the Kilmainham Restoration Society officially submitted their proposal in 1958 the government were highly in favour of it. In 1960 the detailed plan for the project which was also envisioned as a tourist attraction got the approval it needed. Later that year in May the prison keys were handed to the board of trustees. The trustees included members nominated by the society and two from the government. Work officially began on the Prison restoration that saw a workforce of sixty volunteers. It took nine years for Kilmainham Gaol to be fully restored. It was then re-opened to the public. The Magill family where the main residential caretakers, especially Joe Magill who worked on the project from the beginning until it was handed over to the Office of Public Works. Kilmainham Gaol is now a museum and memorial site that showcases the history of Irish nationalism through guided tours of the place. The only you can visit the Gaol is through these guided tours. In the Kilmainham museum, you’ll get to see items that belong to the prisoners from drawings, letters and photographs. The personal items on display help to bring to life the prisoners and the suffering that took place. It really helps to showcase the history of the jail and its occupants. There is also an art gallery on the top floor of the museum filled with paintings, sculptures and jewellery of prisoners from all around Ireland. Guided tours of the prison began with an audio-visual experience in its church, you’ll sit where the prisoners once did. You’ll be taken along the oldest part of the jail, The West Wing. It provides a reality of what life was really like within these prison walls. There is so much to experience on the guided tour. We highly recommend checking out this popular attraction in Dublin. You will learn all about Ireland turbulent past and how far the county has come. How long is the Kilmainham Gaol Tour? A tour of the Kilmainham Gaol will last around one hour lounge and a further 45 minutes spent exploring the museum. When was Kilmainham Jail Built? The jail was originally built in 1796 known as the ‘New Gaol’ to help distinguish it from the old prison it was replacing. Who got married in Kilmainham Gaol? Grace Evelyn Gifford Plunkett, an Irish artist who was an active member in the republican movement got married to her fiance Joseph Plunkett in the jail chapel. Their marriage took place a few hours before he was executed for his involvement in the 1916 Easter Rising. Who was executed in Kilmainham Gaol? The 14 men executed in Kilmainham Gaol were Padraic Pearse, Thomas Clarke, Thomas MacDonagh, Joseph Plunkett, Edward Daly, Michael Hanrahan, Willie Pearse, John MacBride, Eamonn Ceantt, Michael Mallin, Sean Heuston, Con Colbert, Sean MacDiarmada and James Connolly. Explore the incredible history of the Kilmainham Gaol in Dublin, the former prison has been transformed into a tourist museum filled with artefacts and history.